Enugu State Government has approved the award of contract for the construction of Agbani-Afor-Amurri road in Nkanu West Local Government Area by Ambeez Services Limited at the total sum of two hundred, and forty million, four hundred, and fifty five thousand, seventy eight naira twenty kobo (N240,455,078.20). Also awarded was the construction of the Nkanu East Local Government Area Headquarters section of the intractable Amechi-Idodo –Amauzam Amagunze road to Arab contractors Nigeria Ltd at the total sum of forty million, seventy two thousand, nine hundred and fifty three naira thirty eight kobo only (N40,072,953.38) because of the nature of the area's soil texture. The approvals were part of the decisions taken at the State Executive Council meeting held yesterday at the EXCO Chambers, which was presided over by Governor Ifeanyi Ugwuanyi. Briefing newsmen after the meeting, the Commissioner for Information, Dr. Godwin Udeuhele, said that the decisions was in line with the state government's vision to continue to open up the rural areas, give the dwellers a sense of belonging and increase improved agricultural project in the areas. The commissioner outlined other approvals of the Council to include the payment of two hundred and forty million, nine hundred and eighty seven thousand, twenty eight naira sixty eight kobo (N204,987,028.68), covering all the outstanding payments to Setraco Nigeria Limited. The breakdown of the payments include one hundred, and eighty five million, two hundred and thirty thousand, six hundred and forty one naira, thirty kobo (N185,230,641.30) of certificate number eight in respect of the rehabilitation of major roads in Enugu Urban such as Abakaliki dual carriage way, Ogui/Fire Service dual carriage way and rehabilitation of New Haven roads (Chime Avenue), and nineteen million, seven hundred and fifty six thousand three hundred and eighty nine naira (N19,756,389) of the final payment certificate number four to Setraco Nigeria Limited to enhance good business relationship with them. 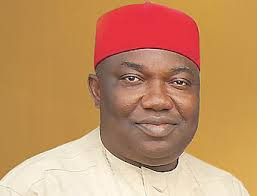 The Government spokesman also informed journalists that the council approved the award of contract for the external work at the Enugu State Medical Diagnostic Centre, Enugu to Ambeez Services Limited at the contract sum of two hundred and thirty three million, two hundred and eighteen thousand, two hundred and sixty two naira eighty one kobo(N233,218,262.81). He said that “this external work will complete the general improvement of the Diagnostic Centre, and give the entire premises a facelift befitting the status of the centre”. He enumerated other approvals of the Council to include the full implementation of inclusive educational policy at the Special Education Centres at Oji River and Ogbete, Enugu to ensure the training of the physically challenged and healthy children in the same learning environment for better integration in the society after schooling, starting from 2017/2018 academic session. This according to the Commissioner wil enhance the opportunities of the physically challenged children trained there to transit to junior secondary school. This, he added, will help "to promote social skills development of these children, and reduce the suspicion gap between these two categories of peers". The Exco spokesperson, said that the Council had in the meeting also approved the bill for a law to provide for the establishment of the Enugu State Debt Management Office and for other matters connected therewith and after that forward same to the Enugu State House of Assembly for legislative action. Explaining further on the issue, the Attorney General and Commissioner forJustice, Enugu State, Mr. Melitus Eze, said that “the debt management office will enable the state to ascertain its credit worthiness and advise it accordingly if contrary”. The Council in the meeting also approved the release of thirty nine million, one hundred and seventy two thousand, three hundred and seventy eight naira eighty kobo(N39,172,378.80) to enable the School of Public Health Nursing (Health Technology, Nsukka) carry out its accreditation exercises in order not to lose its accreditation status and the consequences therein, with “the things needed such as the completion of abandoned buildings in the school, auditorium, more classrooms, provision of E-Library, skills laboratory, water supply, among others”.